We believe business consortiums should spend their time leveraging the power of decentralized solutions instead of navigating the blockchain maze or implementing manual integrations for every use case. Deploying and managing blockchain enabled applications should be as simple, fast, and cost-effective as creating a modern web service. Chainstack’s suite of features makes this possible and helps an organization make the most of its critical resources, namely talent, time, and money. At Chainstack, we believe that business consortiums should spend their time leveraging the benefits of the 'network effect'. Chainstack offers business consortiums the flexibility to experiment with multiple protocols, all from a single dashboard. Currently, we support Fabric, Quorum, and Multichain and plan to support several more in an ongoing manner. We also support deploying nodes on public networks such as Ethereum, among others. You are a business with its infrastructure on public cloud. Or perhaps you deploy it on-prem. Either way, Chainstack gives you the choice and flexibility to deploy blockchains on hybrid environments. 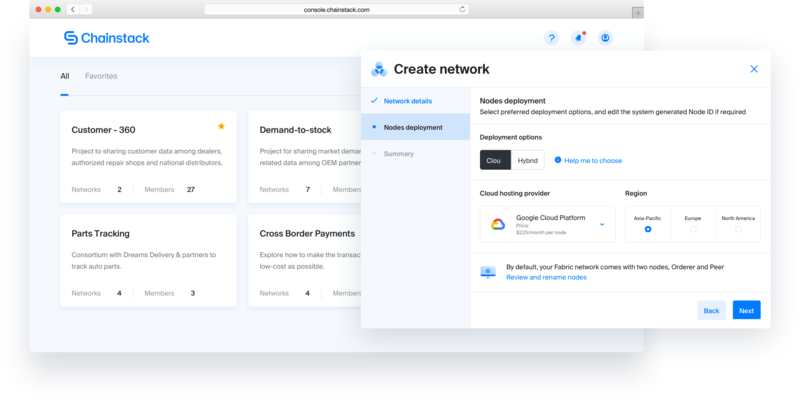 Currently, we support deployments on AWS, Azure, GCP, Alibaba Cloud, and hybrid environments. Support for Digital Ocean and other leading cloud providers will occur in phases. Contrary to popular belief, security is not a given just because blockchain has been implemented. Especially in the context of enterprise consortiums, security is paramount and has to be implemented proactively. Thanks to a leadership team that has strong roots in enterprise security, Chainstack addresses the multi-dimensional aspect of modern-day security in a comprehensive manner. The platform addresses security not only at the infrastructure and website layers, but also at the on-chain and off-chain layers. From granular access controls and node monitoring to handling crypto material via vaults, we have it covered. Deploying and maintaining enterprise blockchains is complex and laborious. It doesn’t have to be so. Chainstack’s intuitive user-interface abstracts away the complexity of implementation. Through grouping mechanisms such as Projects and powerful wizards, users with modest amounts of blockchain or cloud training can deploy and manage a blockchain. A major side benefit is that enterprises no longer have to rely on hard-to-find talent with blockchain expertise. Blockchain is a collaborative endeavor. Simply put, the larger the network or consortium, the more the business benefits. Chainstack enables businesses to form consortiums in a direct and secure manner. No special configuration or long-winded policy. 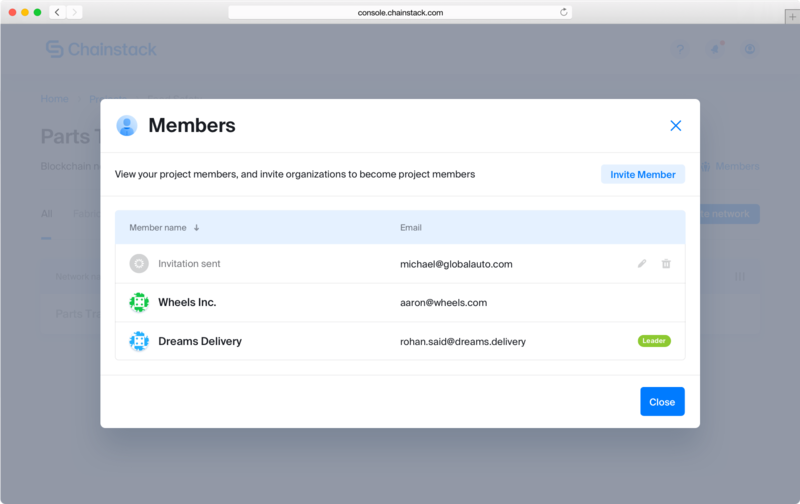 Create a project, invite members, specify how the consortium needs to be governed. It’s as simple as that. If you are an enterprise user, you know the importance of detailed logs, audits, and reports. Whether these reports are for internal use or for regulatory purposes, they need to be granular, clear, and insightful. Chainstack provides users a rich view into several areas of their blockchain networks. Data related to projects, consortium participants, nodes, and transaction activity are provided through logs and blockchain-specific explorers. Combined, the set of monitoring and reporting tools provides both business and IT users with the information they need to run and audit a blockchain consortium. personalized experience on its website. Learn more.